CURRENT_TIMESTAMP is a system function to retrieve the current system date and time. CURRENT_TIMESTAMP is an ANSI SQL function whereas GETDATE is the T-SQL version of that same function. That says it is a non-deterministic function. If you are very specific to ANSI comaptibility or thinking of heterogenous system support, I would suggest to use CURRRENT_TIMESTAMP instead of GETDATE(). As an envision, I prefer to use CURRENT_TIMESTAMP over GETDATE() personally wherever possible. 1. 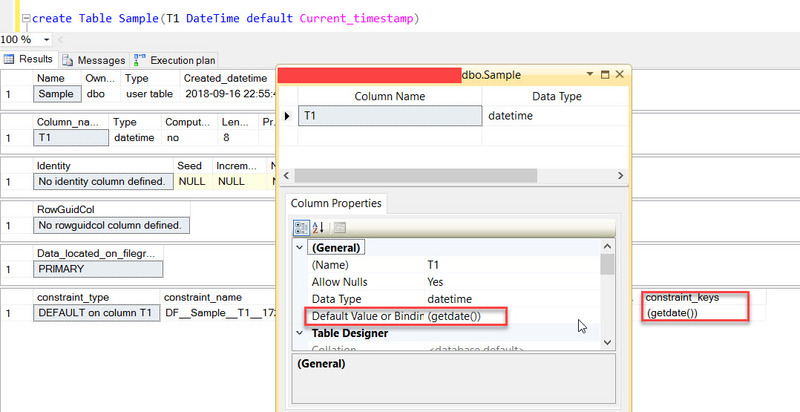 When we create a default constaint with CURRENT_TIMESTAMP, by default, SSMS properties are showing GETDATE(). My thought: This could be because SSMS properties have nothing to do with ANSI compatibility nor hetrogeneous support. My thought: I have no clue why Microsoft has made this so.Its more concerned to me the function with “()” gives an error as below. This post is to provide scripts to identify FIRST and LAST usages for a given date. I will add more usages of FIRST/LAST day to the above list as I come across in future.